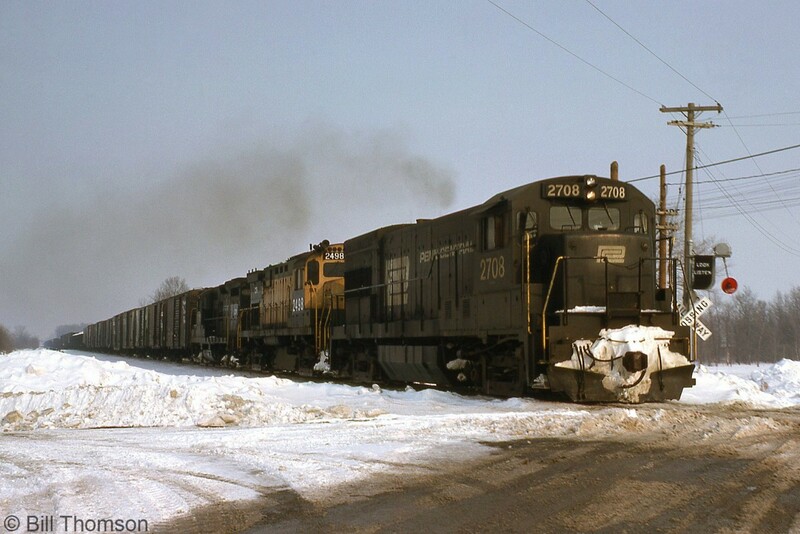 Railpictures.ca - Bill Thomson Photo: The early Conrail era featured a variety of different models acquired from a handful of railroads, often retaining their former owner’s livery with “CR” patching and new numbers added. Here, unpatched Penn Central U23B 2708, Conrail C424 2498 (a patched former Reading unit) and an ex-PC GP9 head a westbound freight out of Niagara Falls to start across southern Ontario on the CASO Sub. Note the wig-wag crossing signals activated. | Railpictures.ca – Canadian Railway Photography – photographie ferroviaire Canadienne. Caption: The early Conrail era featured a variety of different models acquired from a handful of railroads, often retaining their former owner's livery with "CR" patching and new numbers added. Here, unpatched Penn Central U23B 2708, Conrail C424 2498 (a patched former Reading unit) and an ex-PC GP9 head a westbound freight out of Niagara Falls to start across southern Ontario on the CASO Sub. Note the wig-wag crossing signals activated. The former Reading Century is a real nice touch!